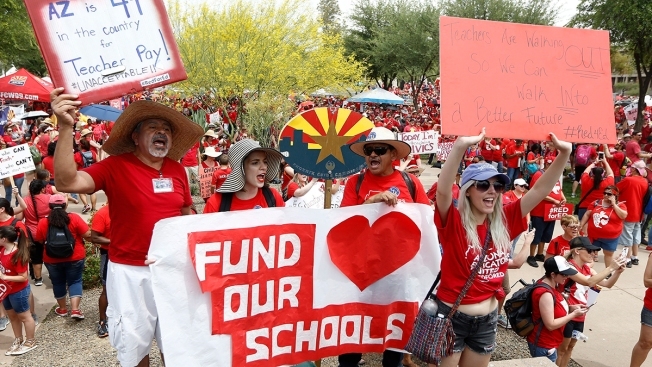 In this file photo from April 26, 2018, thousands chant as they participate in a protest at the Arizona Capitol for higher teacher pay and school funding on the first day of a state-wide teachers strike in Phoenix. Jennifer Williams can’t afford to work just one job. In addition to teaching 10th grade English full time in Baltimore, the single mother works four side jobs, including a waitressing gig on nights and weekends. She also runs her school’s literary magazine, coaches volleyball and supervises the speech and debate team. In the U.S., about 18 percent of public school teachers reported earning income from other jobs during the 2015-2016 school year, according to a June report from the National Center for Education Statistics (NCES). They earned an average of $5,100 from that employment. After a full day of teaching, Williams rushes to pick up her daughter from school and then drops her at home, with barely enough time to get to the waitressing job by 4:30 p.m. When she works the night shift, she’ll get home around 11 p.m. By then her daughter has made herself dinner and gone to bed. “My kid becomes a latchkey kid,” Williams said of her 14-year-old. “I feel guilty that she is taking care of herself. Williams' teaching salary is $50,000. She said she takes home about $34,000 after various deductions. It's far too low to make ends meet, so the income from her other jobs goes toward necessities. Compared to other workers with college degrees, teacher pay has declined over the past several decades. According to a 2016 report from the Economic Policy Institute (EPI), public school teachers’ wages were 17 percent lower than comparable workers in 2015, compared to just 1.8 percent lower in 1994. This disparity amounts to a teacher pay gap, said economist Sylvia Allegretto, who co-authored the EPI report. Although college students are increasingly graduating with large amounts of student debt, the wage gap makes it even harder for teachers who take out loans to pay for their education. Allegretto fears this set of circumstances, along with broader budget cuts, is dissuading prospective teachers from entering the field. Allegreto wasn’t surprised that three of the states with recent teacher strikes—Arizona, Colorado and North Carolina— also had the widest pay gaps in the country. Teachers there earned 63 to 65 cents for every dollar paid to other college graduates in 2015, according to EPI. Kellyanne Brown, a high school government teacher, was one of about 20,000 teachers who participated in Arizona's statewide teacher walkouts at the end of April. Brown has held second jobs in guest services at a movie theater and as a restaurant hostess. She said the odd hours affected her teaching. “I would put off grading and lesson planning,” Brown said in a statement. “My prep is 7th hour and a lot of the times I would sleep at my desk cause I was so tired." Brown wants people to know that teachers "aren't asking to get rich." “We just want enough so we don't have to have second jobs or sell plasma in order to pay for basic bills," she said. Elizabeth Lyon, a teacher for over 35 years, is at the top of her pay scale. She moonlights as a massage therapist after school and on weekends. The extra work pays her rent, but not much else. "We make it through the month, but we’re pretty tapped out by the end of it," Lyon said. Williams has also struggled to make ends meet every month, even with the extra income. She had to request forbearance, halting payments on her student loans. Sometimes she puts the grocery bill on a credit card. She wishes she could spend more time with her daughter.